The Fellowship was fortunate enough to obtain a copy of WEIRD LOVE #5 from IDW Publishing. The writers for the stories are not known; with art by John Forte, Iger Shop, Mort Leav, Bob Rogers, and Odgen Whitney. “Thrill Crazy” – Martha is an ordinary girl who wants to fit in with the rest of the gang…even if it means doing things she doesn’t want to do. When she gets in way over her head, can the love from pharmacist Tom Andrews bail her out? “Mail Order Marriage” – Clara places an ad in the lonely-hearts column in the hopes of finding a man better than the ones that live around her farm. Two men are picked among the dozens that responded; but both have secrets that could shatter Clara’s world apart! GAA! These stories are so crazy; you will find it difficult not to laugh at them. I can’t help but read these “romance” stories from a bygone era – it’s like waiting a train wreck about to occur. The folks at Yoe Books do a great job putting these collections together; and I’m grateful to have a chance to experience these tales. 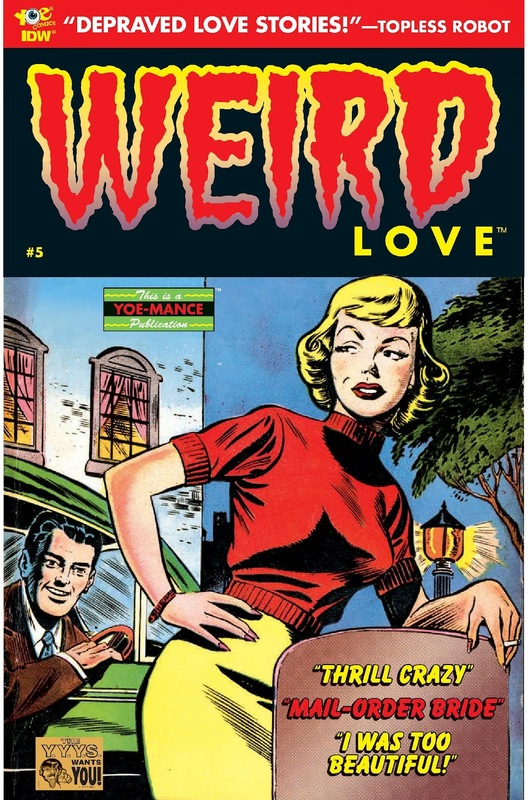 WEIRD LOVE #5 is in stores now, or available for ordering at www.idwpublishing.com.